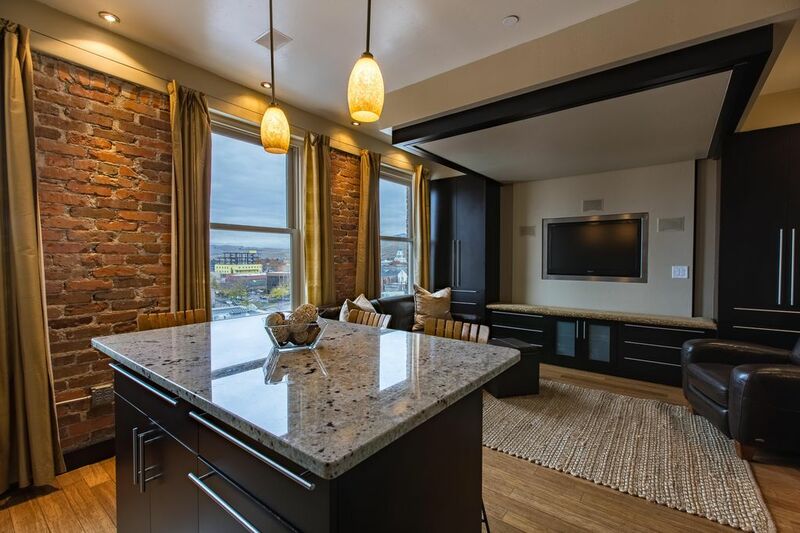 Stay in the heart of downtown Missoula, Montana in a plush, remodeled studio located on the seventh floor of the iconic and historic Wilma Building. Forget the bland hotel rooms and come vacation in a charming space that is oozing with character. The studio includes a custom king sized cantilevered bed that lowers from the ceiling via remote. All lighting is ''smart lighting'' remotely controlled. In-wall Bose speakers are the highlight of the surround sound system in the living room with 2 additional speakers in the bathroom. Enjoy the fine dining that is in walking distance of the condo, or eat-in the fully loaded kitchen featuring granite counter tops, stainless appliances that include a full size refrigerator, range, mini dishwasher, and island. There is a Keurig for your morning coffee or tea, plus all the other kitchen utensils you would need to whip up a gourmet meal. Amenities include a stacked washer/dryer and A/C. Don’t worry about parking as this unit includes a reserved designated parking spot under the Higgins Bridge. You will come back to enjoy the views of the Clark Fork River and Caras Park! The “Wilma” building, built in 1921, is one of Western Montana's well known structures. The theatre attracts all sorts live, musical performances from around the country. Scotty’s Table, is a favorite restaurant located on the lowest level, known for its fine dining and cuisine. The building also has other commercial businesses that include Cedar Creek Day Spa, plus all the apartments on the upper floors that have been converted to condominiums. You are in walking distance to most everything, Kim Williams Trail, Caras Park, The University of Montana, hiking trails, shopping, restaurants, and more. Whether you are planning a “Stay-cation” or getting away from it all, this is the perfect place to stay when you are in Missoula for business or pleasure, outdoor recreation, University of Montana Grizzly sporting events, concerts, visiting family, the Missoula Marathon or for any other reason you are visiting the Garden City! We are a family of 4 living in Missoula, MT. Our daughters always want to come check out the condo and lower the bed! We are business professionals that love everything this town has to offer. HD TV with Cable and Roku/Netflix for streaming movies. This rental does not include daily housekeeping. The cleaning fee is charged for the final cleaning after guest has checked out. My wife and I were visiting Missoula for Easter weekend 2019, and found this loft was perfect for us. The location in the Wilma building is great, because you are right in downtown, and right across the Higgins bridge from the “hip strip” with all of its unique shops and restaurants. We loved the cantilever bed, and the kitchen had everything we needed. Best we could tell, there didn’t appear to be any central heating/cooling in the building, as we didn’t see any thermostats on the wall anywhere. There was a portable air conditioning unit in the closet. Fortunately we never had to use it, as we could keep the room cool enough by simply opening the windows. It was actually really nice to have the windows open, since we could hear the river at night. However, I can imagine in the middle of summer it might get a little hot up here. Corey was immediate in all responses and and very helpful throughout the stay. Can’t wait to come back and stay at the “Loft”. Thanks so much for a great stay! Perfect downtown location, especially if attending a show at the Wilma. The condo was very clean, nice kitchen and living areas, comfortable bed, wonderful view. Owners were quick to respond to questions. Hope to stay here again soon. This was the second time my husband and I have stayed at the studio. We LOVE this place. The owners are great! We 100% recommend a stay here. The loft is fantastic. Walk to everything. Perfectly appointed. PLEASE NOTE: There are several events throughout the year that have 3-night minimum stays including: UM Homecoming, UM Graduation, Big Sky Film Festival, and the Missoula Marathon. Other Nights, weekends, and holidays may be excluded from standard rates. Some weekends require a Min stay of 2 nights. Also note that the bed in this unit sits a little higher off the floor than a regular bed. Some people with disabilities may have a harder time getting in and out of bed. There is a stool provided for your convenience if needed.